Appointments only on the 1st and 3rd Saturdays of each month. 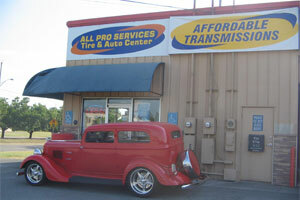 All Pro Services Tire & Auto Center & Affordable Transmission Offers Auto Repair Services You Can Count On! All Pro Services Tire & Auto Center is the automotive expert in Knoxville, TN 37921. Since, 1995 we've provided the Knoxville area with reliable, affordable automotive maintenance and repair services including 4x4 Services, Alignment, Brakes, Car & Truck Care, Diagnostic Services, Domestic Cars & Trucks, Electrical Services, Engine & Transmission, Engine Maintenance, General Services, Heating and Cooling Services, Import Cars & Trucks, Miscellaneous Services, Quick Lube Services, Tires, Towing, Transmission Services and Undercar Services. Call All Pro Services Tire & Auto Center today at 865-584-2335! You can also send us an email. Either way, we're looking forward to providing you with reliable automotive service! I have been a customer of Scott and James for the better part of three years. They have worked on my truck more times than I can remember and every time I can count on honest, professional, timely, and reliable service down to every last intricate detail. They treat my truck like they would if it were there own. I trust them with anything vehicle related from regular service and tuning all the way to extensive electrical wiring and custom fabrication. They have went above and beyond and have even worked on my truck after hours when needed. They are excellent! I have been using All Pro for years now. They have worked on our Nissan and Acura. They do great work, honest, reliable and do not over charge their customers. When I wanted new tires on my SUV that I was very picky about they didn't have the ones I wanted so I ordered the ones I wanted online and had them delivered to them and they put them on for me. They were happy to accommodate me. I highly recommend them, I tell my family about them and I will use them for all my needs. I have been taking my vehicle to All Pro Services for the last 3 years with just about any problem an old classic truck can have, ranging from an engine swap to a brake light repair (and anything in between). Without exception have these guys taken care of me in the time frame they promised and at the price they quoted me. They stand by the work and will resolve any follow up issues if there are any. Aside from Scott and James being very capable automotive engineers, they are really pleasant to deal with. Dealing with car problems doesn't have to be a painful experience. 5 stars from me any day of the week! Love, love, love my boys here...Scott & James. They have been taking care of our auto needs since I moved here and I am delighted to have found them. I refer everyone who asks to All Pro. The prices have been WELL BELOW dealer costs EVERY SINGLE TIME and we have never had any problems with their work, parts or communication. They do all the work on all three of our vehicles. They work around my hectic work schedule and are very accommodating. This team is usually all smiles and easy going. Great guys. Great work. Great Prices.